Dr. Hawkins, MD PhD* spent the last three decades of his life in Arizona, working to correlate the seemingly disparate domains of science and spirituality. In 1983, he established the Institute for Spiritual Research, a nonprofit organization dedicated to consciousness research. In 1995, at the age of 68, he received a Ph.D. in Health and Human Services. That same year saw the publication of his book, Power vs. Force, translated into 25 languages, with over a million copies sold and evoking praise from such notables as Mother Teresa and Sam Walton. 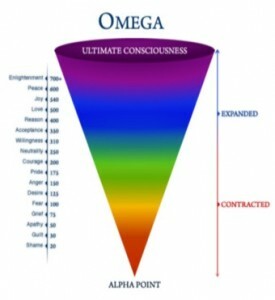 The Map of Consciousness identifies the fact that the more conscious we become, the more we contribute to the harmony and unfolding of the planet. The Map of Consciousness suggests that advancing human consciousness is the most expeditious means by which humans become responsible members of the planet and step into roles that extend our capacities as human beings. Advancing consciousness is the only means by which we can rectify the damage human beings have wrought in their adolescence as a species. In fact, advancing individual and collective consciousness is the only mechanism worthy of our truest attention. For example, one person at 700 on the Map of Consciousness (admittedly a very high number), counterbalances the negativity of 70 million people below 200. One person at 600 (a potentially readily attainable value through CORE Resonance Training™) counteracts the negativity of 10 million below 200, one person at 500 counteracts the negativity of 750,000 below 200, and so on. The Map identifies our priorities as a species, i.e., how we go forward, how we become in-sync with the overall whole, and how we take our rightful place as a conscious and sentient species. CORE Resonance Colonies™ is the ideal incubation environment for such rapid advancement and deployment. — excerpted from The Twelve Premises of CORE Resonance Colonies: for an enlightened world by J.Hamilton. He was a renowned as a physician, author, lecturer, researcher of consciousness and trained as a psychiatrist, had the largest practice in New York. Dr. Hawkins was the Medical Director of the North Nassau Mental Health Center (1956-1980) and Director of Research at Brunswick Hospital (1968-1979) on Long Island and served as a psychiatric advisor to Catholic, Protestant, and Buddhist monasteries. In 1973, he co-authored Ortho-molecular Psychiatry with Nobel Laureate chemist Linus Pauling, initiating a new field within psychiatry.